The coffee industry was made for New York: complex, diverse, fascinating and with plenty of attitude. Since arriving in the 1600s, coffee held patriotic significance during wartime, fueled industrial revolution and transformed the city's foodways. The New York Coffee Exchange opened tumultuously in the 1880s. Alice Foote MacDougall founded a 1920s coffeehouse empire. In the same decade, Brooklyn teenager William Black started Chock Full o'Nuts with $250 and a dream. Third wavers Ninth Street Espresso and Joe made the latest latte craze mainstream. 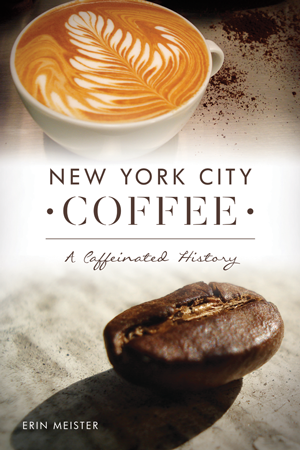 Through stories, interviews and photographs, coffee professional and Tristate native Erin Meister shares Gotham's caffeinated past and explores the coffee-related reasons why the city never sleeps. After a dozen years in New York City and a lifetime in the tristate area, Meister now lives in Minneapolis, Minnesota. A coffee professional since 2000, Meister has worked as a barista, store manager, barista trainer and educator, wholesale account representative and salesperson. In her other life, she is also a professional journalist, writing about coffee (of course) but also music, film, art, food, culture and travel. She loves a good interview and would almost always rather talk about anyone but herself.